The Episode starts with Betaal telling Vikram that Banasur attacked Swarglok. 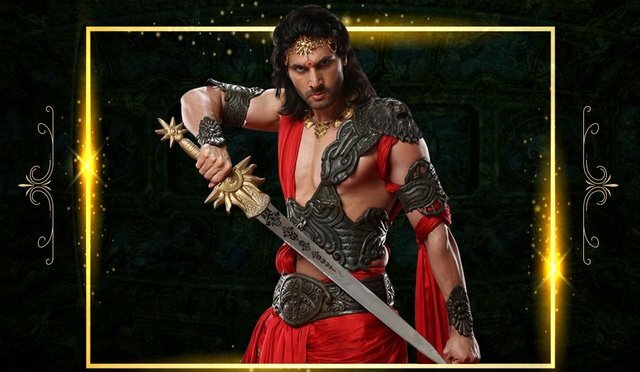 Banasur tells that he will attack Swarglok and will keep it in his control. Asurs cheer for him. Banasur calls Inder dev and asks him to come infront of him. Inder Dev and others appear infront of him. Inder Dev says many asurs had come and returned and says you have no return too. Inder Dev and Banasur attack each other. Banasur becomes invisible and fight with them. He says if you want then you can become invisible too, but this can’t happen. He says only the person seeing me can attack me, but I can attack you all. He says now you all will be ended. Dev Inder says Mahadev can only defeat him and vanishes from there with others. Banasur thinks everyone eloped and says now Asurs will be the creator and ruler of the world. Inder dev tells that until they find the solution, they have to hide from Banasur. Betaal asks Vikram to hear the story carefully. He says time passed by and Mahadev’s curse came true, and Mata Parvati became fisherwoman Parvati. Her mum asks her to listen and says nobody saw any fish in this ghat since years. Her father tells that all the fishermen lost hope. Parvati says I am your daughter and will catch fish from this ghat else I am not fisherwomen Parvati. They think why does she goes always to search fish, it seems she wanted to become fisherwoman. She throws the net in the water and thinks fish understands the fisherman’s sound. She practice to catch the fish and thinks she shall concentrate more. She aims the net and catches many fishes. She calls her baba and shows the fishes which she caught. Her father tells that she is a superior fisherwoman. Betaal tells Vikram that Parvati understood that fishes changes its speed and way according to the movement of the earth and she became superior. Fishermen tell her that she can’t be lucky again and again. Parvati catches many fishes again. They tell that whoever marries Parvati will be the King of fishermen. They ask whom she will choose? Parvati says she will choose her husband in the ghat utsav. Betaal tells Vikram about the ghat utsav. Parvati’s mum asks the fishermen to dance infront of Parvati’s pot whoever wants to marry her. The fishermen dance. Nandi comes to Mahadev and asks him to open his eyes and stop the wrong happening. Betaal says Mata Parvati have to marry the man infront of him, her pot breaks. He asks why did he curse her to become fisherwoman and asks him to think. Nandi asks Mahadev to do something else they will be separated. He says you might be silent, but I can’t stay silent. He becomes big whale and flies in air in the water. The fishermen participating in the ghat utsav run away. Parvati drops the pot. Her mum gets shocked and says nobody is infront of you. Parvati says they have to catch the giant whale. Betaal says Nandi stopped her marriage somehow and made the fishermen scared to come near the water. Parvati says she will catch the giant whale. Her father says it might make you as its food. Parvati says it shall be scared of us as I am a fisherwoman’s daughter. She goes in the water and challenges giant whale to come infront of her. She closes her eyes and feels it. She says I have understood where are you and puts the net in the water. Precap: Parvati’s father announces that whoever catches the giant whale will marry Parvati. Mahadev comes there as a commoner and catches the giant whale. He gets married to Parvati. Banasur comes infront of him and says he wants this beautiful girl to become his wife. Parvati asks Mahadev to protect her. Mahadev says I am a simple human, how can I fight with dangerous Asur.